KUMULS enforcer Neville Costigan has been given the reponsibility of leading his country in his second World Cup. 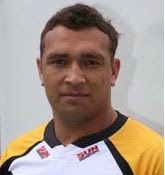 The 2008 Kumuls team survivor said he was honoured to be given the captaincy. “I’m really honoured, proud and privileged. Everything came together for me when Lammy (Coach Adrian Lam) and Mal (Meninga) pulled me aside before the mteam meeting yesterday afternoon (Sunday). When they told me I going to be captain goose bumps ran up my back,” a surprised but gracious Costigan said yesterday. The 28-yearold, who has represented Queensland (2007-2010) under Mal Meninga, is known for his hard-nosed player known for his strong running and tackling. Somewhat of a journeyman, Costigan has played for several National Rugby League clubs including Brisbane Broncos, Canberra Raiders, St George Illawara Dragons – winning a premiership in 2010 – and the Newcastle Knights. He will join the Hull Kingston Rovers next season where he will most likley end his career in the Super League. Costigan, staying true to his hardman persona, says he would choose more often than not to run the ball over kicking for touch or goal. Former NRL bad boy said it was easy to get psyched up for the Kumuls. Costigan appealed to the fans to continue to have faith in the side and to back the players up all the way.